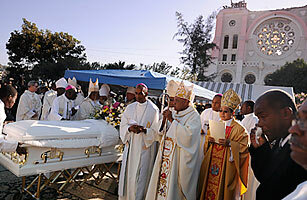 The loss of Archbishop Joseph Serge Miot, mourned on Jan. 23 in a moving ceremony in front of Port-au-Prince's ruined cathedral, has hurt the Catholic Church's ability to respond to Haiti's devastating earthquake. The Cardinal and his Vicar General, Charles Benoit, were among the quake's victims, now numbering in excess of 111,000. Dozens of churches, seminaries and other church-run institutions have been flattened, and perhaps scores of priests killed or badly injured. But for the mourners gathered at the forecourt of the Cathédrale Notre-Dame de l'Assomption for the funeral service, it is the death of Miot and Benoit that hurts the most. Many say the Archbishop, regarded as a humble priest who sought to bridge the divide between the nation's Catholic clergy and voodoo priesthood, was exactly the kind of unifying figure that Haiti needs in this crisis. "He could have brought us together," says Carrel Raphael, a bus driver. "He could have inspired us to work together. He had everybody's respect, and you need a leader like that." Roman Catholicism, once the country's principal religion, has lost a great deal of influence in the past few decades; these days, 3 in 5 Haitians call themselves Catholic, compared with 90% years ago. Miot is credited with reorganizing the church after years of poor management by predecessors who strayed from their religious responsibilities and into Haitian politics. That, say admirers, would have allowed him to work closely with the beleaguered government of President René Préval, which could have used the help. Catholic institutions, ranging from schools to Mother Teresa's Missionaries of Charity, are offering a range of relief services, including first aid, food distribution and the protection of children orphaned by the quake. But the church's efforts have been fitful and poorly coordinated. Some at the funeral Mass said their neighborhoods had not yet seen a priest or nun. "I haven't received any help from the church," says Nicole Metier, who lives near the cathedral. "If the Archbishop had been alive, he would have taken care of us." Bishop Chibley Langlois of the Fort-Liberté Diocese agrees that Moit's loss is a terrible blow but adds that it shows that the church is suffering along with the people. That is little comfort to worshippers like Bernard Bouche, a carpenter, who says the loss of so many priests could not have come at a worse time. "We need them now like never before," he says, tears streaming down his face. "Why did God give us this disaster and at the same time take away the people who could have helped us to survive it?"